The regular and tee-off groups versions of the 'Compare Predictions' pages on Golf Predictor have been updated. As can be seen above (the regular 'Compare Predictions page for the 2015 Greenbrier Classic, there is now a player key below the button which lists the selected golfer's ID and their names. Previously, you had to hover over the golfer ID in the first column of the table to see the golfer name. You can still do this, but all the golfers are now listed above the table for your convenience. 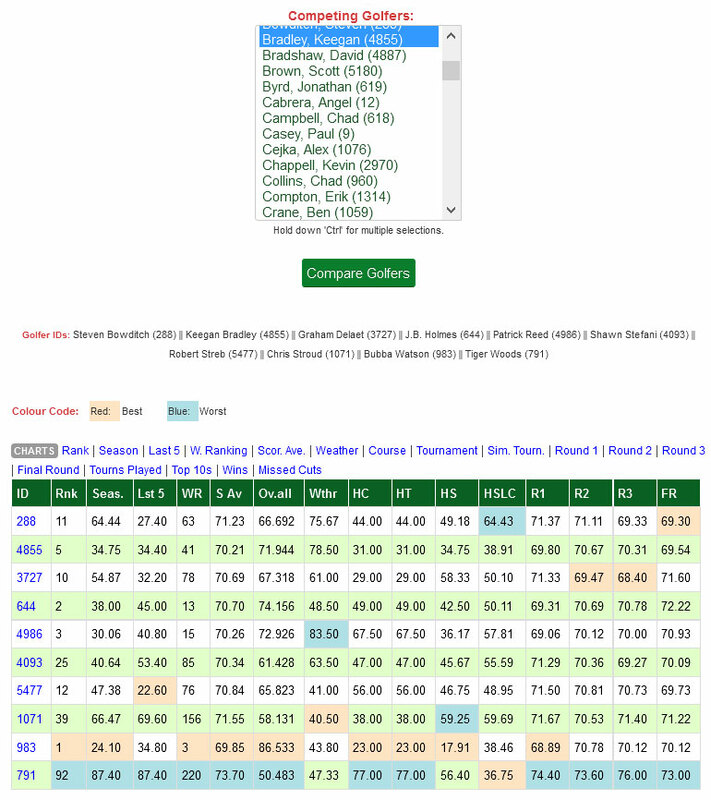 This player key was already on the tee-off groups version of the compare pages on the Predictions menu, but it has now been extended to all the compare pages on that menu. The two 'Compare Predictions' pages have also have another useful new feature. 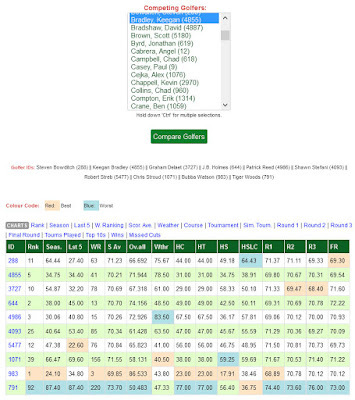 As shown above, the columns have been colour coded to show the best and worst of your chosen golfers (or the tee-off group, in that version of the page) in each statistic. The best golfer's cell is highlighted in red, while the worst golfer is highlighted in blue. This useful new feature allows you to see the best and worst performers at a glance. Looking at the colour coding above for the 2015 Greenbrier Classic, you can see straight away how poor Tiger Woods' stats (bottom row) are compared to the other chosen golfers, while Bubba Watson's(second last row) are relatively impressive. Note that zero and non-applicable values (e.g. for older tournaments with no similar tournament history) are ignored by this highlighting. For obvious reasons, this best/worst colour coding only appears when there is more than one golfer selected! These changes to the compare pages make them even more useful than before. Just another way to make Golf Predictor better! Golf Predictor YouTube Channel Now Available!